We bring forth superior quality Air Compressor Piston Rings in the industry. 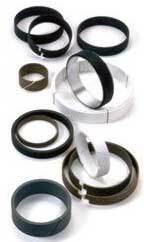 The PTFE Wear Rings made accessible by us are remarkable for their endurable make and efficient function. We supply our Wear Piston Rings in customized specification as required by the clients. Apart from the above fact, we are one of the reputed Wear Rings Exporters and Suppliers in the country.